If you’ve ever considered working for yourself, enjoy making clients happy, want to be more active, be healthier and have a better lifestyle then make an enquiry about a Jim’s Cleaning Franchise today. 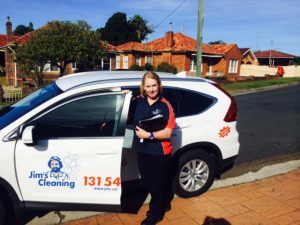 Our domestic and commercial Cleaning Franchises provide you with all you need to get started including equipment, chemicals, training, business name registration, uniforms and stationary as well as ongoing one on one support to ensure your cleaning business is a success from the beginning. The Jim’s Cleaning Group boasts a trusted brand name recognised by over 96% of the public, meaning you get higher prices and instant credibility. All sorts of people join Jim’s Cleaning. Certainly existing cleaners looking for more work, but more often just ordinary wage earners looking for a way to have more control over their income, their hours and their lifestyle. Unlike other franchise models, we don’t just give out opportunities to anyone who ‘wants in’. We ensure that all of our franchisees are good, hard-working people with integrity and a drive to succeed. That’s why the Jim’s Group has been around since 1989 and is stronger than ever. So by joining our team of home service professionals, you’re becoming part of a special group of people who put customer service first and take great pride in their work. Because we all know that great work means everyone ‘cleans up’ come invoice time. The scariest thing in any small business is when the phone doesn’t ring. At Jim’s, we’ve got that sorted. Because we’ve got the most recognised service brand in Australia, our phones never stop ringing, so you’ll never_ have to worry about getting enough jobs each week. Cleaning is one of the best repeat businesses to be in because homes and businesses keep on getting dirty. Why find new customers all the time when you can regularly help the customers you’ve got and continue making money in the process? Despite plenty of work on offer, you’re the boss. So you can dictate when and how much work you’d like to take on. You can choose to spend more time with family (while still making a good income) or work hard and bank a handsome profit. It’s entirely up to you. And staying active? You realise it’s not a desk job right? We Take Care Of The Little Things, So You Can Get On With Making Money. So many small business owners are on a never ending merry-go-round of trying to find customers, chase payments, do the work, buy supplies, manage customer expectations (and somehow find time for their families too). It’s a completely different experience with Jim’s Cleaning. Full training in all aspects of your business, so you can be highly efficient and effective straight away. Plus, we offer a Pay-for-Work Guarantee of $1,100 per week, so you can rest assured you’ll make a very solid income from day one. Your success is our success, so we’re here to help you every step of the way. We love to hear from enterprising people who want more out of life from running their own business. If that sounds like you, then simply fill in your details below. We’ll contact you for a FREE Consultation and answer any questions you may have. Best of all, we’ll show you how you can take control of your future with a Jim’s Cleaning franchise.